A magazine cover is a work of art and a thing of exclusivity. It's a magazine's first contact point with a potential buyer on the newsstand. Most of the time, a person makes a decision whether or not to buy a magazine based on its cover. So we here at Top Gear Philippines work our butts off coming up with a great cover every single month. One of the things we do to accomplish this is to put an "exclusive" car on the cover--meaning one that readers will get to see on our pages first. When it comes to our cover, we give priority to carmakers that also prioritize us. We think any leading--i.e., No. 1 or best-selling or most widely circulated--publication in its respective category has earned the right to demand for exclusive cover stories. We have no problem relegating a really nice car to secondary billing if the story isn't exclusive, and we also don't have a problem putting on the cover a somewhat lesser car that has been exclusively entrusted to us (as long as the brand isn't Chery or Great Wall, that is). So imagine our amusement when we saw the above image on a recent trip to the US. 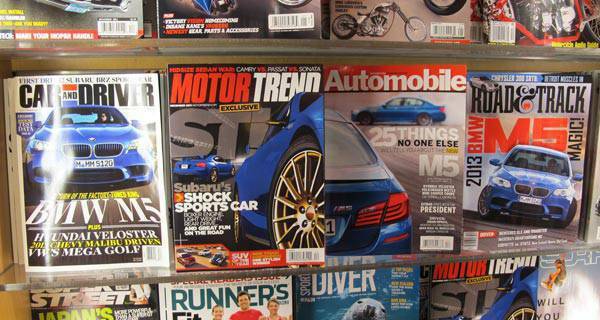 Three of the top four American car magazines have the same car on their December cover: Car And Driver, Automobile and Road & Track all have the BMW M5 (in the same blue paint job at that) on their glossy wrappers. Only Motor Trend had the originality to put a different car (Subaru BRZ) on its cover. Is there a Munich-based conspiracy here? Did BMW pay big money to pull off this kind of publicity stunt in the second-biggest car market in the world (in case you've forgotten, China is now the biggest)? Well, we honestly don't think so. We believe that all BMW did was host a global media test-drive event--something all carmakers do--and the editors of C/D, Automobile and R&T simply felt that the new M5 is too important a car model not to be honored with a cover. Not to mention the fact that this sports sedan--being an iconic enthusiast car--has great sales potential at the newsstands. 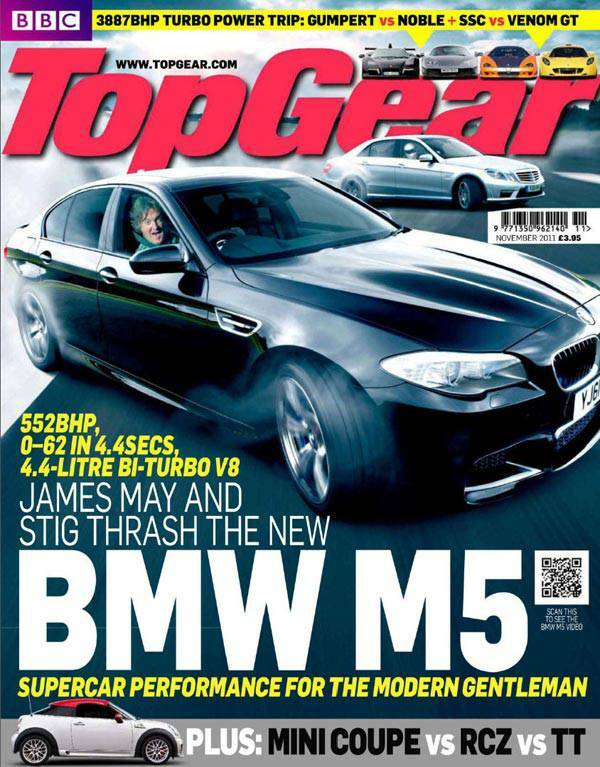 On a related note, Top Gear UK itself had the BMW M5 on the cover of its November issue (below), the James May-penned article for which will appear in our very own Luxury Issue this December. Watch for it.